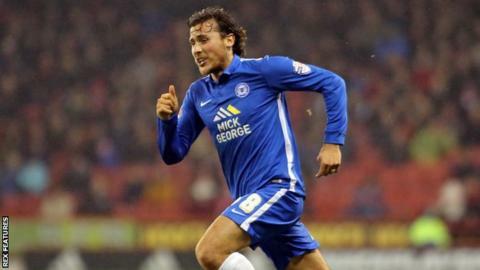 Lawrie Wilson says boss Graham Westley was a factor in moving to Peterborough on a 28-day loan from Bolton. The defender, 28, played under Westley at Stevenage and made his Posh debut as a half-time substitute in Saturday's 3-2 win against Sheffield United. "He's probably changed a little bit now, got more experience, good and bad things have happened," said Wilson. "But I jumped at the chance to play under him because I think he brought the best out of me when I was younger." Wilson moved to a Posh side who have won eight of their last 11 games in all competitions and currently sit sixth in League One. He joined Bolton in the summer after making 108 appearance for Charlton over three years, but has only played nine times for Neil Lennon's side. Bolton are three points adrift at the bottom of the Championship following Saturday's loss to Huddersfield, and are £172.9m in debt, received a winding-up petition last month and have paid their players and staff late. "I've been coming on and off and it's just been a horrible start to the season so it's nice to come here and start playing again," Wilson told BBC Radio Cambridgeshire. "It's hard for the players there at the minute, they're sticking together. They lost on Saturday but got the win over Blackburn the other day. "But it's been brilliant coming in here - the lads are very close, very good together." Meanwhile, Peterborough have extended the loan of West Ham midfielder Martin Samuelsen until the end of the season.